Now, buying a new car, truck or van can be easier than ever, without the guesswork or the stress of haggling with a dealer. 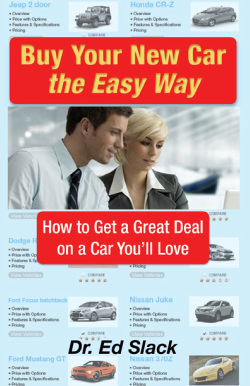 Buy Your New Car the Easy Way: How to get a Great Deal on a Car You’ll Love is a step by step guide that will save you time, money and headaches, and comes with a $1000.00 money back guarantee. Dr. Ed Slack is a psychologist who understands communication far beyond the walls of his office practice. In Two Legged Snakes: Understanding and Handling Manipulative People, he offers wise insights to the reader about how to avoid those fellow humans who would attempt to manipulate them. Starting his complexly illustrated book (a very wise choice for this informative guide), he states, “The greatest single factor determining your level of happiness and success is whom you listen to and whom you trust.” What follows is a very wise lesson, peppered with hilarious examples as well as strong warnings of signs to watch for. In combining his pungent ideas and enlightening ways of recognizing and avoiding Two Legged Snakes, Dr. Slack uses copious well-drawn illustrations that drive the messages home. His book uses quotes from famous people to enhance and validate his teachings, such as Albert Einstein’s “Insanity is doing the same thing over and over again and expecting different results.” This is a fun book to read—brief and well organized—and at the same time, this is a manual for helping us deal with a phenomenon that we never really knew existed! In the United States vehicular accidents will occur more than 5.5 million times this year, causing over 2 million injuries and more than 31 thousand deaths. They are the leading cause of death for teenagers and children, and the main cause of Post-Traumatic Stress Syndrome (PTSD) in our civilian population. Driving is the most dangerous activity most people engage in and most of us who drive will eventually get into some type of traffic accident. It helps if we’re conscious, aware drivers but even the most conscientious and cautious drivers aren’t immune. The following is a thoroughly fact checked and researched guide to successfully dealing with the circumstances created by being in an accident, and includes forms and recommendations for ‘Crash Kits’ that you can keep in your car so you’ll be well prepared if it happens to you. It could save your or a loved one’s life.